A large community of homeless people gathers at Birmingham’s Linn Park. They gather near the fountain as the sound of running water blocks out street noise, citizens say. There is a common, grim image traditionally associated with homelessness: a dirty, desperate man with a long beard sitting on the corner of a street alone, occasionally begging passersby for nickels. However, this extremely public image of the indecent homeless man does not reflect the true demographic of the homeless community. In truth, most homeless individuals consider the streets too dangerous to live on. Pettet and her close friend Hannah Baker visit members of the homeless community in Five Points every week. The pair help lead a Bible study, which they say is mostly led by a seven-year member of the Five Points houseless community. Even more contrary to the common face of homeless is the fact that the majority of the homeless population is hidden from view. 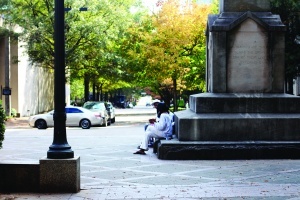 According to the needs assessment study, only 12 percent of the homeless population in Birmingham stay on the street. About 34 percent stay in transitional housing, 22 percent in emergency shelters and 12 percent in treatment facilities. Around 82 percent of Birmingham’s homeless have been homeless for less than 2 years. Pettet said that many of the people who live on the streets of Birmingham suffer from severe loss of identity and dignity as a result of being homeless. “He put that stamp on his identity and assumed that the nice girl that gave him food was going to walk away,” Pettet said. This is the second installment of a five-part series.